Virtual, Augmented or Mixed Reality, 360…it’s known by several names and may morph into more before it takes over the world. Statista’s conservative prediction is that the market will grow from $3B now to $40B by 2020. Others in the industry think it’ll be much higher. Orders of magnitude higher. The medium is different than a movie, video game or theatrical production, but has things in common with all of those. So says Rafael Pavon, creative director at Future Lighthouse. Virtual Reality has the capacity to immerse you more fully into the story, feel moments more intensely, be closer to the characters involved. You are no longer outside, looking in. You are inside. VR makes the participant feel things at a deeper level. If you’ve ever laughed, teared up or shouted in reaction to a movie, you’ve displayed your EQ of empathy for other people. 360 immersion into experiencing other realities, will sharpen that aspect, making the participant feel what it would be like to be in places they otherwise would never be able to be. This not only requires acceptance – the saying yes so often purported in improvisation work actors undertake– but it requires respect for your audience. To date, the point of view VR writers have fashioned their stories around are from privileged observer, no one sees you, and you cannot change anything. You can be an observer who can change things. You can also be a character without impact or even a character with impact. With each special point of view an adjustment in approach is required of the actor or narrator. In essence, it is getting closer and closer to embodying the participant themselves. The fall of the fourth wall in VR makes users vulnerable in ways that are unprecedented. With VR, we step beyond empathizing with a character who acts as our representative in the world – we become characters inhabiting the space. Meeting this requires vulnerability on the part of the actor or narrator, as well. Astrid Kahmke of the Bavarian Film Center says virtual reality involves a shift from time-based narration of beginning-middle-end storytelling to spatial narration. It’s not storytelling, per se, it’s world-building. It’s not narrating, it’s creating. It’s not linear, it’s nonlinear. Immersive media causes a strong visceral reaction and cognitive belief in what is experienced. Belief puts the real into virtual reality. Books, theatrical productions, movies, all of these require us to enter a complicit contract. One where we must suspend our disbelief: that what we are reading/hearing/watching is real, when we know in fact it is not. 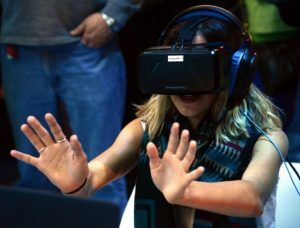 VR gives our sensory input a push off the deep end. We perceive the unreal to be real. The power of the resulting visceral reactions and cognitive belief is profound. Companies and institutions that capitalize on virtual reality’s novelty and use it on their websites, in learning opportunities and other forms of engagement, provide their customers/users a more intense experience than traditional media, making them and their brand more memorable. To paraphrase Pink Floyd, in Virtual Reality, the narrator is in my head. There is little distance in the case of characters and no distance between you as the narrator and the user. As such, your voice over performance needs to be better than best. Authentic, genuine, real, natural. Soft, I have found. You’re the angel sitting on the shoulder, the little bird who told them. More than any other medium, your facility in making the written word sound like your very own will ensure you continued voice work in VR. What have your experiences been in virtual reality? Though most days, Kim Handysides is found narrating from within a 4×6 padded cell, her virtual reality today is from the cold pristine Canadian mountains, on the edge of a lake with sifted snow dusting the ground and a pale blue sky overhead.